Sarah Lee Guthrie is Woody Guthrie’s granddaughter — and the youngest daughter of Arlo Guthrie, whose “Alice’s Restaurant” took satirical folk protest songs to a whole new level — so her first children’s CD, Go Waggaloo, carries a greater weight of expectation than most debuts. Then again, most artists don’t debut on Smithsonian Folkways, a label geared much more strongly toward the music of the past, but Guthrie’s music fits right in: Waggaloo adds a vibrant new thread to the tapestry of traditional American music, weaving together a seamless blend of original songs and Woody Guthrie covers to produce a lovely, yet wonderfully raw, hootenanny record for the whole family. 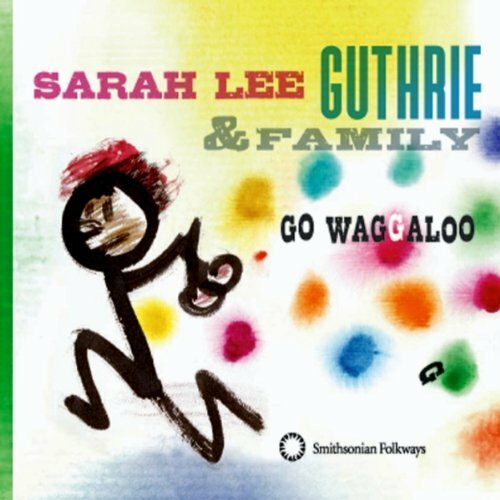 Go Waggaloo is credited to Sarah Lee Guthrie & Family, and the credits reflect that spirit: Songwriting credits are spread between Sarah, her husband Johnny Irion, and their daughter Olivia, and a whole passel of Guthries — plus family friends like Pete Seeger — show up on the recordings. The connections between the musicians — and from the musicians to the songs — translates into an album whose warmth is felt from the first sunny strains of the opening track, “Don’t I Fit in My Daddy’s Shoes?,” and lasts clear through to the final ringing chords of “Oni’s Ponies.” In between, you get a half hour of fun that includes the joyous title track, the startling morality tale “Oh How He Lied,” the lovely “Big Moon,” a transcendent group runthrough of the classic “She’ll Be Coming ‘Round the Mountain,” and much more. It feels less like an album than an accidental peek into a very talented family’s singalong, which fits right in with the Guthrie/Seeger musical mission statement: Singing is just as important as listening, and everything is more fun when we all join in. And joining in is easy where these songs are concerned — as Arlo attests in his booklet essay, he recently concluded a concert by performing a Sarah Lee song he’d only heard on YouTube, and had the audience singing along before it was finished. Give Go Waggaloo a few spins with your family, and be singing along too. This entry was posted in Music and tagged Arlo Guthrie, CD Review, Jeff Giles, Pete Seeger, Sarah Lee Guthrie, Sarah Lee Guthrie & Family on November 11, 2009 by Jeff Giles.